Horses congregate at Denkai Animal Sanctuary in Carr, Colorado. The pace of animal rescue has skyrocketed the past year, especially for horses, as people from Colorado who have lost their properties in the national housing crisis abandon them when they move out. The global food and fuel crisis is resulting in more than just people going hungry. Rising grain and gas prices, as well as the closure of American slaughterhouses, have contributed to a virtual stampede of horses being abandoned  some starving  and turned loose into the deserts and plains of the West to die cruel and lonesome deaths. Horse rescue projects, which are mostly small, volunteer operations with limited land and resources, are feeling the consequences of this convergence of events. In the meantime, many now unaffordable horses are being sold to abbatoirs south of the border where inhumane methods of slaughter are practiced. "It's a growing problem. Basically, it's the economy," says Brent Glover, who has run Idaho's Orphan Acres since 1975 and has found new homes for 1,600 rescued horses. "We're getting calls constantly." With more horses coming onto his 50-acre refuge, he is feeling the pinch of a hay bill that has risen from $28,000 to $80,000 this year, not to mention rising transportation and grain costs. "It's a horrible mess of bad consequences," says Colorado State University animal sciences Professor Temple Grandin. "People are turning them loose because of the decline in discretionary spending." 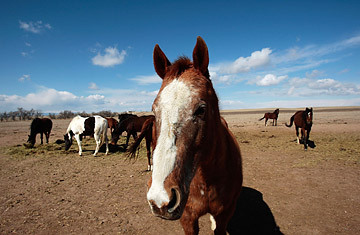 Outside Pueblo, Colorado, 101 rescued horses graze on 850 acres at Dreamcatchers Equine Sanctuary, and more are on the way. "It's a very scary situation right now," explains manager Julie DeMuesy. "Everybody's stressed to the max. It exploded for us at the end of 2007." Some horses are coming from people who have had their mortgages foreclosed, and can't afford to feed their steeds. "We're trying desperately to reduce our herd [by sending horses] to good homes. It's become a revolving door  They're coming in as fast as they are going out to new homes." And the problem isn't limited to the West. Earlier this week, nearly 120 starving horses (along with some ponies and donkeys) were taken from a ranch of a Central Florida woman who had become overwhelmed by the demands of caring for the rescued animals. Another reason for the rise of numbers, in addition to economics, is the absence of U.S. slaughterhouses. (The last three were shut in 2007 after several court rulings came down against horse slaughter for human consumption.) Says DeMusey: "We're seeing a lot of elderly horses and horses with special needs that normally would be sent to slaughter." Says Montana livestock transporter John Chaffee: "What can you do with all these horses? You can't bury 'em all. I have nothing against eating horse meat. I wouldn't eat it, but millions of people in the world do." Chaffee says he has stopped hauling horses to a plant in southern Alberta, Canada, because of costlier trucking restrictions and Canadian humane-group pressures at border crossings. "People who protest slaughter ought to have a bunch of these old horses starving to death in their backyards." Colorado State's Grandin, who helped refine standards for humane livestock slaughter, says Americans have an "ick" factor when it comes to the idea of horseflesh, equating it, she says "killing and eating pets." But, Grandin argues, "the problem is, these are 800- to 1,200-pound pets. When they shut down those plants, I said we've got to avoid alternatives worse than slaughter. But we have not, and all my worse nightmares have come true." Chaffee says horses that are taken north to Canada are treated humanely. But with the long-distance hauls now being prohibitive, horses in the southern U.S. are being laundered through a series of dealers into Mexico. Says Colorado State's Grandin: "At the Mexican border, they just wave the trucks through. The conditions down there are horrible." Proposed legislation to outlaw U.S. horses for slaughter may get passed, says Grandin, but the law won't be enforceable because Mexican "kill buyers" can circumvent the law by labeling horses as breed stock or for riding purposes. And such a law may not ameliorate the plight of American horses in an economic downturn. Longtime Montana horse breeder Kathy Thornton says she will cut back on the number of her brood mares producing offspring every year, because of high costs of feed and transportation, plus the sudden drop in value of her well-tempered colts. A three-year-old trained ranch horse that traditionally would bring upwards of $1,500 fetched only $525 at a sale 175 miles away, a transaction that cost her $200 in truck fuel. "I'm open for barter," says Ms. Thornton. "I'm now trading horses for cattle. Personally, I don't send horses to slaughter, but I'm glad if it's available. I sure feel bad for the poor horses left alongside the highway."